Whether you're a business or leisure traveler, hopping from country to country is a breeze when you have Currency+ in your hands! 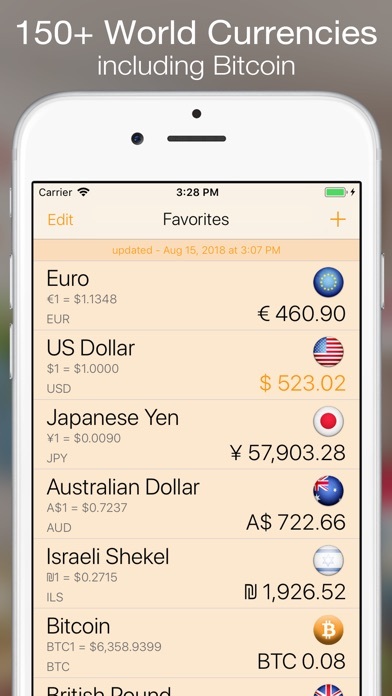 This Universal currency conversion application for the iPad/iPhone/iPod Touch shows you what you're paying instantly and is easy to use even when you have jet lag. 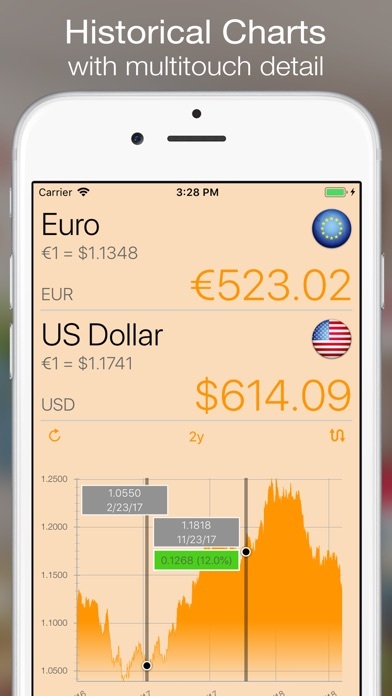 KEY FEATURES: - Currency Calculator - Apple Watch Support - Today Widget - Support For Over 150 World Currencies, Precious Metals & Bitcoin - Historical Charts - Trend Analysis - Background Rate Updates & Currency Alerts - Editable Calculator Tape - Inverse Currency Calculations - Transaction Fees or Taxes - 100% Ad Free What Makes Currency+ stand out from other Currency Apps? Currency Calculator When you are traveling in a different country, most of the time your focus will be on converting the local currency back to your home currency. 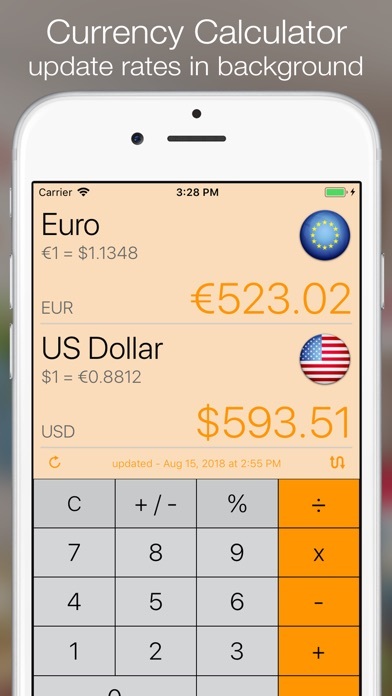 The built in calculator lets you focus on two selected currencies on one screen. The built in calculator remains on the screen at all times making data entry quick and easy. Apple Watch Use Currency+ on the Apple Watch. 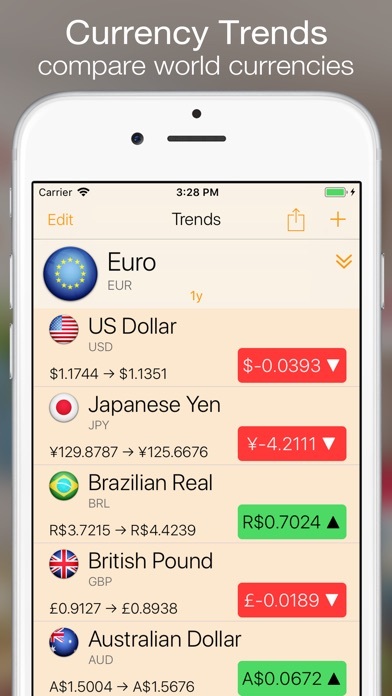 See your favorites currency list and your Currency Alerts directly on the watch. Today Widget Use the Today Widget to quickly see the conversion rates between all your favorite currencies. Tap the rate to reverse the conversion. Tap any of the currencies on the list to set as the base currency. Support For Over 150 World Currencies & Precious Metals For times where you want to keep track of many currencies at one time, the favorites list is where you need to go. You pick from over150 world currencies and precious metals (powered by Yahoo.com). Selecting any currency in your list, enter a value and the rest of the currencies in your list will show you that amount in their own currency in real time. Historical Charts Currency+ has historical charts. You can view historical currency conversion charts for any two currencies. Touch the chart with a single finger to see data from any period in the past. Touch the chart with two fingers to compare currency exchange rates from any two past periods. Show charts for 1 day (real time intraday), 5day, 3 month, 6 month, 1 year, 2 years and 5 years. 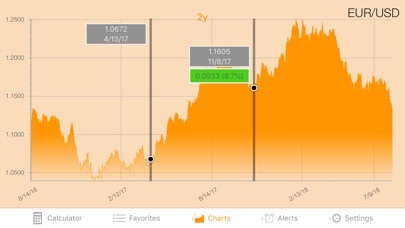 Currency Trends With Trends, you can select any of the 150+ world currencies and compare it to a list of other currencies to see how it has performed over time. See if your currency has strengthened or weakened. Select your time period from days to years. Export your work to an email, text, note, etc using the trend share sheet. 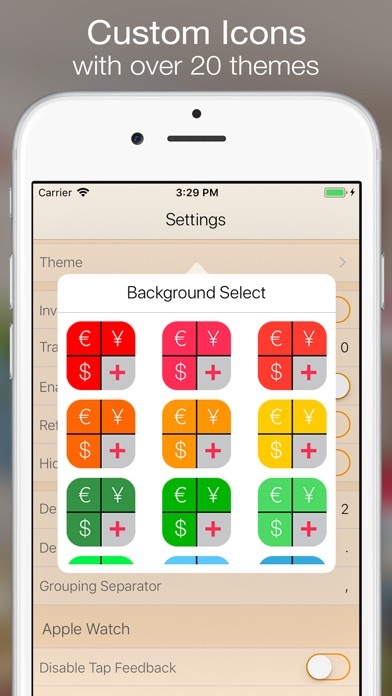 Background Rate Updates & Currency Alerts Currency+ will go out and update your currency rates without taking your device out of your pocket. Whenever you open Currency+, your data will always be up to date. 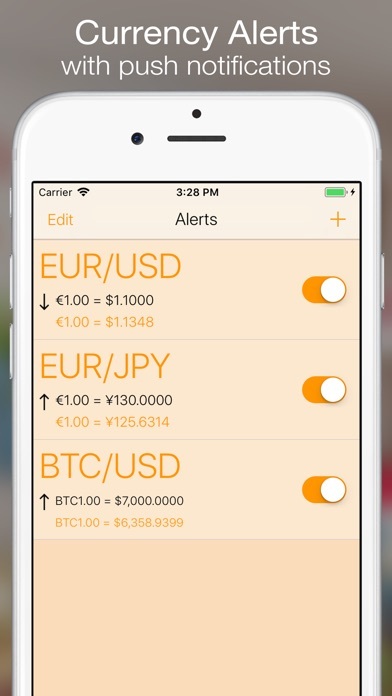 Do you want to be notified when a currency goes above or below a certain value? If so, Currency+ can notify you of these changes without the need to open the app. You will receive a push notification on your device whenever the currency you are watching goes beyond the limit you set. Editable Calculator Tape Currency+ has an integrated calculator tape that keeps track of everything that you do. You can send any value from the tap to any of your favorite currencies. You can edit/delete/insert tape values and your calculations will automatically update. Finally, you can put comments on any of your tape values to help you keep track of what your numbers stand for. Inverse Currency Calculations Need to do inverse or reverse currency calculations? Currency+ can switch between standard and inverse currency conversion modes on the fly. Transaction Fees or Taxes Currency+ can factor in transaction fees (or tax) automatically. Individuals rarely convert money at published exchange rates - most banks and exchange offices charge a fee. Enter the transaction fee percentage to give you a better estimate of your 'real' conversion rates. Make the leap with Jump Gap Software's Currency+, the currency converter that takes you around the world and back. No update on currencies ? I have an issue ! No update on currencies !!! Super easy to use, much more efficient and practical than googling money conversions!! User friendly ... very helpful especially when travelling abroad.